American Snakeskin is comprised of members from St. Dad, Neon Blud and Diet Cokeheads. Usually, name-checking which groups the members of a band also hail from is a futile attempt to somehow qualify the purported “super-group” as something greater than they actually are, but not in this case. The context for American Snakeskin’s formation actually reveals some of what informs their bleak, maladjusted Americana screeds. Neon Blud and Diet Cokeheads are often pegged as “noise-rock,” but the dense clamor on their records is not the focus of their music. The impeccable rock ‘n roll sneer apparent in each track takes precedent, while the added cacophony seems like a wise afterthought. Turquoise for Hello, on the aptly named upstart Florida label Janitor’s Closet, largely abandons the aggressive tumult evident in Neon Blud and Diet Cokeheads’ music and amplifies the rock ‘n roll swagger through the lens of murky blues. Specifically, the variety of illicit blues that the Bad Seeds channel on The Firstborn Is Dead or the Southern witch doctor voodoo incantations of Jeffrey Lee Pierce. That is, blues when it conjures something distinctly diabolical and eerie. Neon Blud, Diet Cokeheads and other Floridian deviants have inspired long-winded ruminations on what it is about the state that still-births such bleak bands and this record sets American Snakeskin firmly in that recent legacy of sonic uneasiness. Ponce De Leon was reportedly searching for the Fountain of Youth when he discovered Florida, the southwestern coast is notoriously afflicted by red tide (an algal boom resulting in reddish seawater,) and the state is a peninsula jutting very close to one corner of the fabled Bermuda Triangle. These waterborne curiosities are likely part of what instigates the moody undercurrent afflicting recent Florida bands, but American Snakeskin epitomize such neurotic proclivities. “Desert Buzz” sets the record’s tone appropriately with rattlers, tape hiss and slow, morosely twangy guitar leads that could soundtrack a dystopian western. The tempo accelerates and a cow-punk back beat ignites nearby tumbleweeds, but the pace is doused with acid rain and the song struggles to trudge along. At its most turgid moment, “Desert Buzz” returns to gallop into oblivion with a searing outro guitar solo that sounds like Peter Laughner and Richard Thompson stuck too long together in the saddle. The southern doomsday element never relents on Turquoise for Hello and such thematic cohesiveness is part of its appeal. 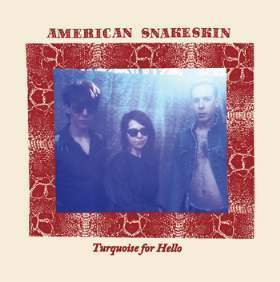 With music doused in such murky production, its easy for bands to rely on noisy segues to mask underdeveloped songs, but American Snakeskin’s song-writing is a fully realized opiate breeze. Their songs drift in between disparate parts gracefully despite the plodding pace and sluggish vocal delivery. ZZ Rameriez employs a druggy drawl that cements the record’s uneasiness. It’s a particularly potent technique on “Itching and Scratching,” where the vocals sound like they’re spoken through grinding teeth with a mutilated tongue while the singer picks scabs on his arm. On “Round the Way” vocal duties are relinquished to a Vivienne Rohan whose dulcet but intimidating coos give way to an organ solo that saunters out of the mire like the death rattle of listeners’ psyches once this EP is over. In a musical climate where “Americana” indicates the pedestrian, finger-picking pastime of aged punks, its refreshing to hear American Snakeskin hijack the brittle exoskeleton of country and blues, imbue the bones with a distinctly Southern mysticism and shatter them with modern neuroses. Of course, considering American Snakeskin “Americana” requires some imagination, but their music seems informed by Florida. They carry on the region’s musical lineage distantly, and epitomize Florida’s recent legacy of uneasiness. Whatever regional characteristics or water-borne ailments compel the citizens of Florida to eat each other’s flesh seems at least partly responsible for Turquoise for Hello. American Snakeskin's Turquoise For Hello is available via Janitor's Closet. Seed to Flower Thursdays with volcano!